Our attraction is a family friendly yard display that is free for all to visit. Its purpose is to capture the magic of being a kid at Halloween. The display is mostly homemade and features a cemetery theme with tombstones, mausoleum, flying ghosts, and cemetery fence with a gated entrance. Suitable for little ones as our haunt is tame, but fascinating for all ages. Raven Manor is open after dark for 3 nights a year, October 29th - 31st. Look below for specific times and location each October. You can post comments or questions to us from our Guestbook, Facebook page, or you may e-mail us. The display runs from 7 to 10 PM each night. 2018 marks our 20th Halloween! 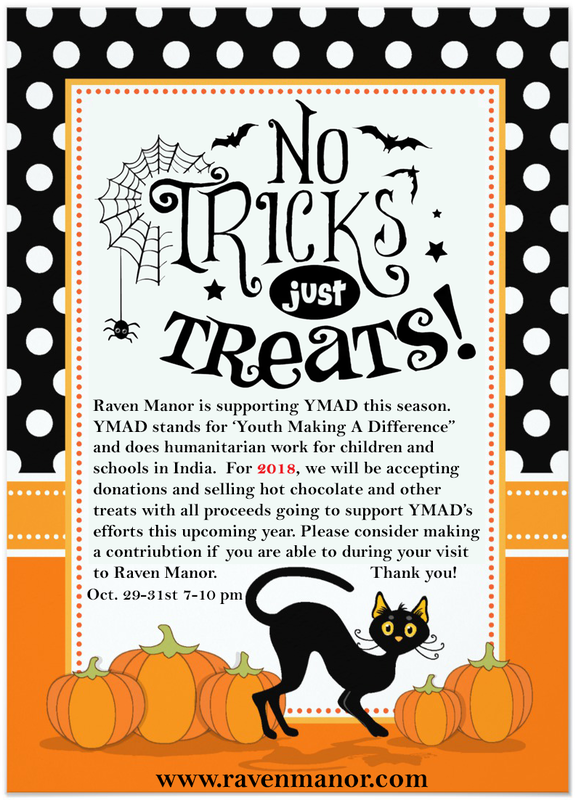 Hey Goblins and Ghouls... Raven Manor is supporting YMAD.org and its humanitarian efforts to help children and schools in India next Summer. 100% goes toward the cause. We hope you can visit Raven Manor for 2018! We should be right in front of you. Just look for the house with the ghosts! My fascination with Halloween started when I was about 11 years old and I started decorating the house with homemade and store bought decorations. I enjoyed tinkering and building things that brought enjoyment to others, and Halloween turned out to be the perfect excuse to put my talents to work on a display that would enchant and mesmerize those that would later visit Raven Manor cemetery. Like many I had humble beginnings, and although I've been creating spooky yard displays since the mid-1980s, the name and theme for Raven Manor didn't materialize until 2001. It was about a year before this when I found what others were doing and sharing online. I was inspired and ambitiously started building. Since then, we have stuck with the same theme and continue to enhance the display as possible. You can read more in depth on the History of Raven Manor. For me, it has always been more about "the show" and less about being scary. We keep the display family friendly and fun for all ages. All the hard work and imagination that bring Raven Manor to life each year are meant to bring happiness and a little bit of "magic" to our guests of all ages. This is what it is all about, capturing the magic of being a kid on Halloween night. I started hosting ravenmanor.com to contribute, share and hopefully inspire others that are unable to visit in person. I was inspired to create what we have by others sharing of ideas and photos online. In addition, a great source of inspiration to me is Walt Disney and Disneyland, including (of course) Disney's Haunted Mansion. I had always wished my career to be a Disney Imagineer, but I am happy to at least claim it as a hobby. Where did your display items come from? Just about all of it is hand made, with ideas from the Internet. The tombstones are made of extruded foam board, cut, glued, and painted. The epitaphs are carved out of the foam by hand with a hobby knife. The ghosts are made from Styrofoam heads and covered in sheer fabric. The mausoleum, cemetery gate and fence were made from wood and sprinkler pipe. Read more about each project in the Projects section. Where do you store all of this stuff? Where don't I store it? It takes up a considerable amount of storage space. The mausoleum breaks down into pieces to make it more manageable to store. I used to store much of it above my 2 car garage door (see photos and video below), but we moved in 2014 and have a large garage where everything goes now. Where else can I see great local haunts and displays? I have started a listing of other local home haunts that will give you a few other neat displays to check-out. KSL.com has a 2018 listing & map of local displays and haunts. 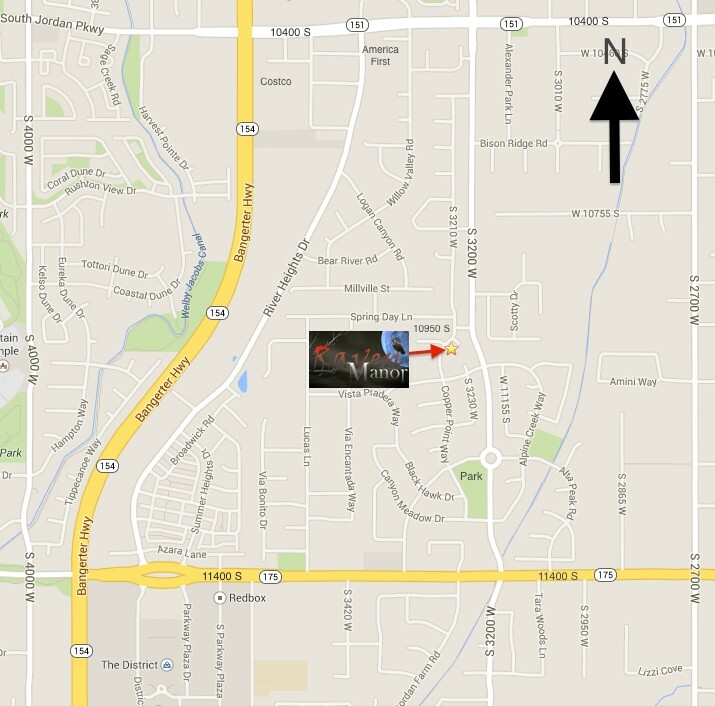 You can also try the UtahHauntedHouses.com site below, as they have a good listing of many home haunts as well as comercial haunted houses.